Officials at the Boys' Club of New York (BCNY) are moving forward with their plans to sell the Harriman Clubhouse on 10th Street and Avenue A. A listing for the 7-story building is now active on the Cushman & Wakefield website. The building is currently configured as a 7 story walk up building and features and expansive 119’ of frontage on East 10th Street and 71.25’ along Avenue A. The 9,067-square foot (119’ x 102.21’ IRR.) lot is split zoned as R7A/R8B with a commercial C2-5 overlay – commercial FAR 2.0, Residential FAR 3.45/4.0, with IH 4.6 community facility 4.0. The building will be delivered vacant making for an ideal conversion opportunity or continued educational/recreational use by an end user. The 50,000-square foot building is comprised of classroom, office, gymnasium, auditorium, music studios, recreational and pool space. Every floor boasts 10’+ ceilings with many touting double height ceilings. The concrete slab construction enables virtually beamless floor plates and allows for large open rooms. The East Village is home to a number of newly completed condo and rental developments. Many of which has already been absorbed by neighborhood demand or sold before building completion. The Steiner at 437 East 12th Street, The Jefferson on 211 East 13th Street and 100 Avenue A are among many of the condo developments that are rapidly selling in the neighborhood. According to the letter to alumni, the BCNY will look to rent space elsewhere on the Lower East Side to continue with programming for Harriman members after the closure next summer. 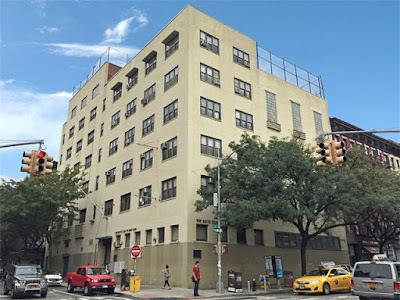 The letter also stated that the sale of the East Village building would allow BCNY the opportunity to start new programs in other communities, including Brownsville, East New York and/or the South Bronx. In his letter. Tosh wrote that: "The neighborhood surrounding the building has changed dramatically since Mr. Harriman built this building, especially in the past few decades." In August, the Daily News obtained a copy of the Feb. 24, 2015, BCNY board meeting minutes, in which Tosh stated that "enrollment was actually rising sharply, based on an increase over the preceding five-year period, mainly among boys and young men from low-income families." 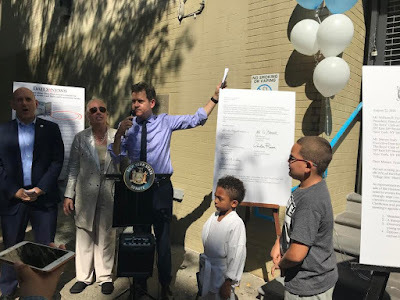 This past Saturday, Manhattan Borough President Gale Brewer, State Sen. Brad Hoylman, Assemblymember Harvey Epstein, City Council member Carlina Rivera and Manhattan Community Board 3 officials held a press conference outside the Clubhouse to urge the BCNY board to postpone the sale until they consult with the community in "good faith." "More than a quarter of Lower East Side residents live below the federal poverty level," Hoylman said in a statement. "Clearly, families in the East Village and Lower East Side still need the services and programs offered at the Harriman Clubhouse. I urge the Boys’ Club of New York to identify the needs of boys and young men in our community and meet with us to try to find a solution to save this precious neighborhood resource." As Patch reported last week, Tosh declined meeting with elected officials in a Sept. 14 letter. "Our role in the neighborhood defines us," Tosh said. "It is also bigger than any one building. Wherever our East Village clubhouse is situated, we remain a vital part of an ever-changing area." "It’s extremely disappointing that the Boys’ Club is putting the Harriman Clubhouse on the open market for $32 million without community engagement, an analysis of local needs or concrete plans to continue their services and programs for young men and boys in the East Village and Lower East Side. The local community has good reason to be angry and confused, and will, unfortunately, see this as another example of a nonprofit selling out the neighborhood, putting real-estate profits ahead of the needs of young people and contributing to the wholesale gentrification of their neighborhood." Developers are already drooling over the location, corner spot, overlooking a city park it doesn't get better than this. It will be demolished regardless of the paying price, and the Mayor will pass a zoning exception allowing for the EV's first real luxury tower. Meanwhile a fantastic community organization which has probably steered low income boys to better lives by keeping them off the streets and giving them activities and structure will vanish all due to greed. Carolina we will be watching you. why can't there be a compromise ? let a developer pay $32 Million to be able to build 6 stories on TOP of boys club .. Very sad. My son attended afterschool programs here for two years. But I suspected something was afoot when they changed their membership rules so much that we weren't able to participate any more and stopped collaborating with our school to bring students over--now I see they were probably trying to reduce local membership in order to facilitate this sale. Yes I'm sure developers will be lining up to fork over $32,000,000.00 to continue using the building for "educational/recreational use," because there's so much profit in that. Creeps. Anyone look into how many millions in public monies they receive? Leverage that and their six figure salaries at the top heavy organization will come to the table with the quickness! They currently have $62 million in assets.Steven Tosh makes over $300,000 in compensation and cannot even meet with our elected officials???? And there are twenty more that make over 6 figures. It won't be demolished, just completely gutted and remodeled because it is overbuilt for its zoning. Anybody that thinks the East Village needs this service more than Brownsville/East New York is simply selfish. There are many community centers in this neighborhood, not to mention one at every NYCHA development. None of them are at capacity. So get out there and sign up. What really stinks here, in addition to this obvious cash grab from the real estate boom, is their dishonesty about what they are really doing. Their records show that membership was rising, yet they claimed that gentrification of the East Village had decreased demand for ther services. They have non-profit status, which should require that they at least tell the public the truth when it comes to major decisions. But why should the Boys Club tell the truth when Mount Sinai led when they decided to sell off the real estate they had acquired from Beth Israel, claiming that usage of the hospital was down, which was also untrue. Having non-profit status also means they will pay no taxes on this windfall real estate deal, robbing the city once again of tax revenue. If they are going to take actions that negatively impacts a community, they should at least be honest about why they are doing so. Only someone with a vested interest in this development would post absurd comments like the ones at 10:42AM and 10:51AM. We are in this predicament because of greed and gutless politicians. As Giovanni pointed out that the BClub is a non profit and must disclose their finances to the public. They also receive tax breaks and donations from the city, state and individuals and corporations. Yet they get away with refusing to meet with our local representatives. Why? Because the BClub knows our pols won't/can't do anything because our beloved Mayor Bill won't allow it. Remember he's the one who gave away Rivington House to his campaign contributors for peanuts and they turned it around and made a 100 million profit... Mayor Bill for all his crowing about being "progressive" in no better than Trump. He's a bully and a liar. This is about ONE PARTY RULLE. This is about weak and useless pols who owe their existence to the Dem machine. If they don't tow the party line, they're out. So God forbid they should stand up to the BClub's lies and manipulations and not take them on with the force of government behind them. Rivera could go to the city council and ask them to condemn the BClub move. Ask for full disclosure. Ask the Mayor to step in. But the best that our local pols can do is write a letter. This is about me first politicians. And we, the voters, aren't even in the top 5 of who comes next. ONE PARTY RULE. ONE PARTY RULE. What is the poster at 10:51 a.m. talking about? This neighborhood is not full of community centers offering after-school programs. That's why this boys' club is so vital. Is there any way we can convince them to change their mind? We already lost the corner of 11th and A to a luxury building that was supposed to include affordable units, but, of course, those units somehow disappeared from the plan. If there is going to be housing built in this neighborhood, it needs to be affordable housing for the middle class and lower income residents losing rent-stabilized units. To add to cmartyy’s point, as a non-profit, the Boys Club is able to raise an enormous amount of money comprising the majority their annual budget, and tis only possible because all donations are tax deductible. This means that ther entire budget comes at the expense of all taxpayers. We grant them this right In order to support their mission, part of which has been to serve this community. They have a legal obligation to disclose their finances and to be transparent about their financial decisions. The same way all non-profits are forbidden from taking kickbacks or doing corrupt deals, they also have an obligation to disclose why they are really making this decision. So far the Boys Club’s public disclosures have not only been lacking, they have been suspiciously untimely, making this disclosure only at the very last minute. As a non profit, any sale of real estate will have to be approved by the State Attorney General. 9:29 has the right idea, why not build condos on top as a compromise? At this point we're getting condos either way, but that could help keep the Boys' Club in the neighborhood. Another disgusting "deal" that completely ignores the needs of this area and its residents in favor of the Mayor and his cronies getting pockets full of $$$ - and the developers laughing all the way to the bank. NYC has always been a slightly shady operation, but now the mayor & developers don't even try to disguise the sh&t that goes on. "Our role in the neighborhood defines us," Tosh said. "It is also bigger than any one building." You think Carl Fischer said that when they sold their building for condos? Where are they now? What a commenter said above the AG and or a Judge has to approve this in the end, so lots of ways to fight! who are entitled to notice pursuant to N-PCL § 511(b). appraisal cannot be done by a broker involved in the sale of the property. " all not in ny but they are all conneted and this was with two minutes of looking.